Patagonia Hosts “Bike to Work Week” to Support the Greenway! Patagonia recently held its 2011 Bike to Work Week, part of a company-wide initiative to encourage the use of non-motorized means of transportation, and Brooklyn Greenway Initiative (BGI) was thrilled to be selected as a local partner. This year’s program, held June 5-11, reinforced Patagonia’s promotion of the environmental benefits of alternative commutes, and many stores partnered with a local transportation advocacy organization. Beyond providing these organizations with a venue to recruit supporters and spread their message during our Bike to Work Week, local Patagonia stores supported these groups financially – the more miles employees rode during their weekly commute, the more money Patagonia donated to the organization! BGI was selected as the local partner by the Patagonia Upper West Side store. Last week, braving both record-breaking heat and fierce thunderstorms, Patagonia UWS employees bicycled a whopping 638 miles, raising $830 for BGI! 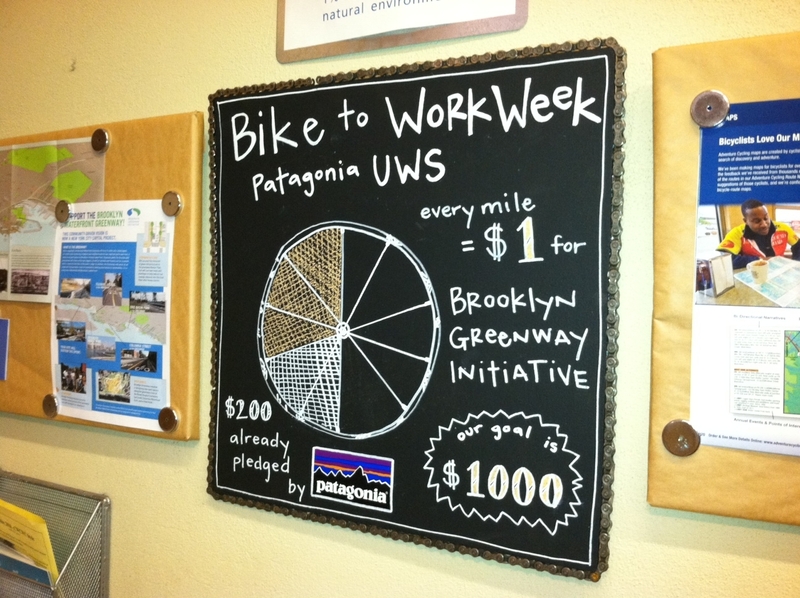 Many thanks to the whole crew at Patagonia UWS for their ongoing support of the greenway.